Can you tell me your compiler settings? As always, much thanks for this terrific editor. Really, it is great. I just updated to the latest build from build 2730. I am thrilled that all the basic issues for using it at full high resolution on a hi-DPI display seem solved (I was using it with a "manifest" file to force Windows 10 to treat as DPI ignorant, as it was impossible to use otherwise). The PSpad_64 icons are just right on my display (3840x2160 with Windows 10 scaling set at 250%) and the various visual issues all seem solved. I have found one issue. 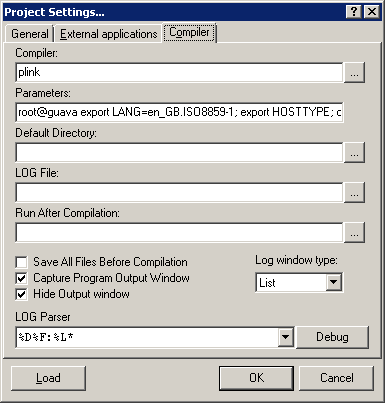 The text in the Programs Settings dialog box displays VERY large (and the dialog box is not sizable), to the point that it is not possible to change the settings there. This is true of all the text in every pane in this dialog box and the buttons at the bottom. The other settings dialogs seem fine. Oh, wait, I do see one other minor visual issue. The hash marks for the ruler are almost hidden. It looks as if the spacing is just a bit off so that they are being covered by the editing window. These are minor issues. I, at least, do not often change settings, so no rush on needing that (and I can always put the manifest file back in place temporarily). But I wanted to let you know so you can add them to your list to look at. I found a problem with Settings dialog. It's fixed, including direct edit dialog. Bookmarks are fixed too already. I will paint it manually instead of pictures. It basically kicks off a makefile with gcc on Linux using plink. Same settings work fine in pspad4. Edited 1 time(s). Last edit at 2017-03-09 08:31 by gwinkless. When I call compiler, I get PLink help in the LOG. Edited 1 time(s). Last edit at 2017-03-09 08:57 by pspad.